Well, our website http://www.adoptionjustice.com is down. That is a sad, sad thing because there was so much good information on it! We hope to get that one back, eventually. But in the meantime, we’ll be posting here. Have a fabulous day, and may your technology be snag-free! TRACK was proud to be a co-sponsor of the 6th annual Single Moms’ Day on May 11, 2016 at the parliament in South Korea. This year, we focused on universal birth registration and the payment of child maintenance by non-custodial parents as two ways to create a world without child abandonment and child trafficking. The main hosts were KUMFA and KoRoot. Co-sponsors were KUMSN (Korean Unwed Mothers Support Network), TRACK, InTree (Unwed Mothers for a Changed Future), Seoul Single Parent Support Center, MP Shin Kyung-rim (Saenuri Party), MP Kim Choon-jin (Democratic Party), the Korean Child Support Agency, the Salvation Army, and Dandelions group of adoptees’ families of origin, along with LexCode interpretation services. Thank you as always for your support and love, and for your solidarity in our belief that every child should be given an opportunity to grow up with his/her parents as the first measure, supported by basic provisions such as birth certificates, child support, and the protection of personal privacy. You may download the The 6th Single Moms’ Day conference booklet for free on this link. We have noticed when talking with foreigners that they assume that Korea’s system is just like theirs. Because they lack a basic understanding of how underdeveloped the Korean system is compared to theirs, it’s hard for them to get a foothold and understand what we are talking about. Therefore, we made this chart to first acknowledge what most people from developed countries assume is normal. Then we move on to describing the bleak reality of Korea. Universal birth registration O The hospital birth certificate is a legal document or birth registration is confirmed by another office such as a government agency. It is recognized that birth registration is a child’s human right. X Parents are compelled by law to register the birth of a child. However, it is a voluntary “registering” system, not a true reporting system. All the responsibility is placed on one person. Married and unmarried parents, both men and women, are obligated to register their children. The hospital birth certificate is more like a souvenir with no legal force. Birth registration is not available for non-Korean citizens except through their own countries’ embassies. Effect in Korea: Children’s rights can easily be fundamentally violated. There is some confusion among foreigners about the “family register” because adoption agencies use that term instead of “birth registration.” However, what are really talking about is birth registration. It is possible to falsely register adopted or brokered children as the biological children of domestic adoptive parents, and children may easily be anonymously abandoned before being sent to orphanages because they lack any legal existence. Modern alternative child care system O Most other countries have a formal system in children who cannot stay in their families are assessed, and an appropriate course of care is decided for them out of a range of options, including foster care and kinship care. Support for the family of origin is the first priority. Children are separated from families only when they are in danger if they stay there, and adoption is used only when efforts for family reunification fail. X Korea’s first solutions to alternative childcare has been more or less the same since the end of the Korean War: institutionalization in large orphanages or adoption. Group homes and foster care have been introduced recently on a small scale. Small support is available for grandparents caring for grandchildren. There is little to no effort to reunite families who are already separated and not enough support to preserve families of origin, particularly unwed mothers’ families, by the Ministry of Gender Equality and local governments. Effect in Korea: Adoption and institutionalization are the first resort for children who cannot be cared for in their families, with adoption viewed as better than institutionalization. Therefore judges cannot really refuse any prospective adoptive parent’s request to adopt, even if they find the parents to be unqualified, because there is no better option prepared for the child. In addition, child abuse and murders are happening all the time. One reason is because there is not an adequate alternative childcare system. Judicial or administrative process determine the “adoptability” of a child (as well as family separation if needed, etc.) O A judicial or administrative process determines whether a child should be declared a ward of the state or in need of protection, should be adopted, should be put into or taken out of an institution, etc. The type of care arrangement or adoption is determined based on a psycho-medico-social assessment of the child. X There are no judicial or administrative procedures in child welfare law to determine whether a child should become a ward of the state or a child in need of protection, a child in need of adoption or a child who should be put into an institution. They just describe some forms of alternative care: institutions, group homes, and foster families. Where a child ends up (adoption, institution, foster care) is simply decided by their parents. Private adoption agencies decide whether adoption is in the best interest of the child. There is no government authority that determines whether a child may be put up for adoption by the parents or not. The family court judge makes the final decision to approve the adoption, but that final court decision is also the government’s first and only intervention. Effect: Any child may be relinquished for adoption or left in an institution simply because their parents choose to do so, and any child may be accepted into the adoption system or the institutional system by an adoption agency or institution. Tracking children is impossible; they may go in and out of institutions, or also move throughout the country. And weirdly, my paper did not make it into the booklet in English. If you would like to read it in English, just go to the previous post on our website here. In a nutshell, this article says that the National Assembly Research Service, which researches laws before they go for voting, has said that Korea’s birth reporting system can still be abused for the purposes of illegal adoption. The problem is that there is no back-end administrative check; they trust the person reporting the birth 100%. Well, of course people lie, and in particular those people who want to adopt children and pass them off as their birth children have lied a lot on reports like this. However, Korea is not changing that now because … (mind you, this is not my logic) … they say that if babies’ births were reported from the hospital, unwed mothers would not go to the hospital for childbirth, and therefore both the unwed mother and the child’s lives would be endangered. Unwed moms: EVERYTHING IS ALL THEIR FAULT. The main accomplishment of the amended Korean family register law, from the perspective of unwed moms and other single parents, is that it protects everyone’s privacy. You can click here to read about that. The following parts of the law, regarding who is responsible for reporting the birth of a child, is also of interest to adoptees. This cartoon produced by the Korean government shows that in other countries, personal information such as that about adoption and divorce cannot be known by looking at people’s identification records, and in this way, discrimination is prevented. 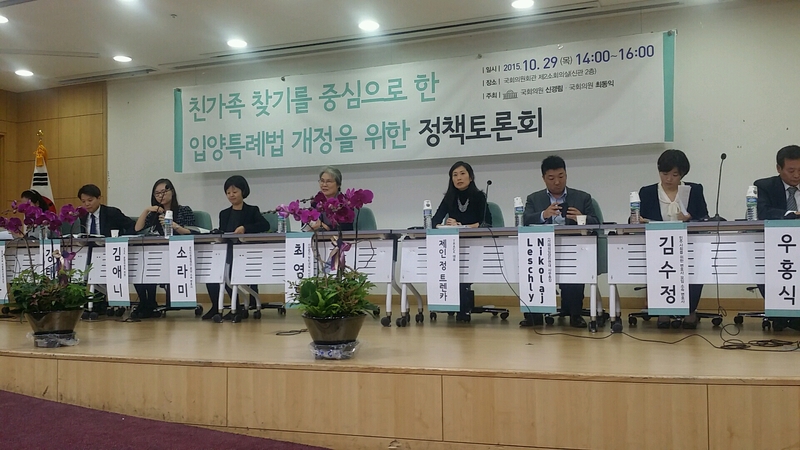 The panel on the right shows that in Korea, people such as this unwed mother have been discriminated against because such information can be seen by others. “The unwed mothers are dropping their children at the Babybox because they fear registering their children’s births, which the adoption agencies require.” That is what we hear from the Babybox people. However, an amendment to the Family Register law passed the National Assembly on May 18 and the Cabinet Council on June 2. It’s a done deal! The effect of this law will be to protect everyone’s privacy so that employers and others will not be able to see “sensitive” information on the family register such as children born out of wedlock, adoptions, divorces, and the like. The law will be implemented on Nov. 19 this year. In the decades following the Korean War, South Korea may have sent up to 200,000 children overseas for adoption. Some adoptees, well after becoming adults, suspect that their adoption may have been illegal and wish to pursue civil litigation in the South Korean courts against the adoption agencies and the South Korean government. Others also want the South Korean government to prosecute criminally those they believe were responsible for orchestrating their adoptions. But rigid application of South Korea‟s statutes of limitation precludes both civil and criminal cases in connection with international adoptions. This Article proposes, based on principles from other jurisdictions and South Korean precedent, that the South Korean courts and its National Assembly should provide an exception so that illegal international adoption cases can proceed on their merits. In the alternative, the Article proposes that South Korea should establish a Truth and Reconciliation Commission to conduct a thorough examination of the process that sent so many children abroad. The Article concludes that South Korea should not dismiss as untimely claims that the state and the adoption agencies engaged in illegal practices. Whether through the courts or through a neutral truth finding commission, allegations in connection with international adoptions deserve a serious and meaningful response.